A team that is coming off a championship season doesn't have much need to change the formula. So the Buffalo Bandits came close to standing relatively still entering the 2009 season. The comings and goings of franchises, as usual, did have an effect on the roster. Arizona opted to go out of business rather than play in 2009. Its players, who had been subject to one dispersal draft before the 2008 season only to have their rights revert after the season, went through another such draft in June. The Bandits took Greg Hinman. In July, the Bandits lost Kyle Laverty to Boston in the expansion draft. Then in mid-December, Chicago announced it would not be ready to play in the 2009 season. Calgary took Tom Montour from the Shamrox in the dispersal draft, and then quickly sent him to the Bandits for a 2010 first-round draft choice. "I found out the team was folding when I got an e-mail two days before it was announced. It was pretty crazy," Montour said. Buffalo grabbed Cody Jacobs in the expansion draft. The pregame ceremony also included a well-deserved tribute to Buffalo News writer Tom Borrelli, who died in a freak accident while covering a high school football game in November. Outside of the Kilgour brothers and John Tavares, Borrelli may have done more than anyone in Western New York to grow the sport. His excellent work in covering the team from 1992 to 2008 gave the team legitimacy in the community. "Tom is going to be tremendously missed by this organization, and by me personally and my brother personally," Darris Kilgour said. A week later, a trip to Toronto proved Buffalo could win a defensive struggle, taking an 8-6 game. Tavares and Steenhuis scored in the fourth quarter to break a 6-6 tie. On January 16, Rochester came to town without its starting goalie, Pat O'Toole. By the second half, the Knighthawks couldn't keep up with the Bandits and essentially stopped trying to do so. The Bandits recorded a 23-6 victory that wasn't as close if the store indicates. Steenhuis had eight goals and five assists, while Roger Vyse had five goasl. The Bandits scored three short-handed goals within eight minutes. "If they aren't going to play, it's on them," Kilgour said. "We're not running up the score at all. If they don't want 23 goals on them, they have to show a little effort." The Bandits hit the road on a three-game trip from there. They beat Minnesota, 10-9, and Edmonton, 13-8. They lost in Philadelphia, 13-11, to spoil thoughts of an undefeated season. Still, Buffalo roared through the end of the first half of the season. The Bandits thumped Toronto, 25-10, on Feb. 14. Steenhuis set league records with 13 assists and 17 points. "He's got a great shot and he's strong on his feet. That's a good start," said Roger Vyse, who had six goals, about Steenhuis. "He uses the rest of us really well out there, and it's good when we can help him." Six days later in Toronto, Buffalo spotted the Rock a big lead, and came charging back in the second half. Steenhuis tied the game with 38 seconds left in regulation, scored the game-winning goal 46 seconds into overtime for a 17-16 win. The Bandits were 7-1 at the midway point, and looked like the class of the league. They were even getting Pat McCready back from a major shoulder injury that cost him the first half of the season. But there was one catch, even if no one really knew it yet. They hadn't played anybody. Only one game in the first half was against a 2009 playoff team, and Rochester was not at full strength. 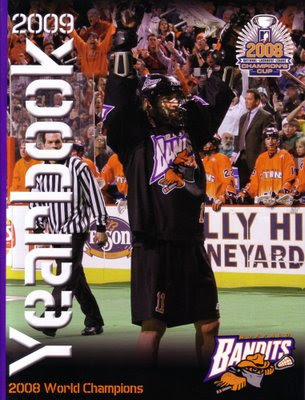 The second half of the season started with a home against Minnesota, and the Bandits blew a lead and dropped a 16-15 decision. "It was awful -- a disappointing loss," Tavares said. A week later after the All-Star break, Buffalo lost a 15-14 overtime decision in Rochester. The Bandits played well in a 14-4 win over Portland at home, but lost, 11-9, to New York. "They outgoaltended us," Darris Kilgour said about the Titans. "I thought we outplayed them, outshot them (59-40). I thought Mikey [Thompson] let in some easy ones. I'm not too upset. I think if we had shot better, we'd have won the game." They rebounded with a pair of wins, one at Boston and another against Rochester on a brilliant performance by goalie Ken Montour (52 saves). "My defense was great in front of me," Montour said. "They forced them to shoot from way outside. I've been struggling with rebounds lately, and the defense picked me up." But Buffalo lost two straight to finish the regular season. The final game against the Blazers was particularly disheartening. Boston came back from a 10-5 deficit in the third quarter to win, 13-12, in overtime. The loss cost the Bandits first place in the East, losing that edge to New York in a tiebreaker. "I'm very, very, very, very disappointed the way we played -- the amount of energy we put out. It was disappointing to say the least," Kilgour said. Steenhuis and Tavares tied for the league lead in goals with 51, and Ken Montour had the league's lowest goals-against average (9.57). Montour and Billy Dee Smith were named to the first team all-pro squad, while Steenhuis and Tavares were second-teamers. The team also set a league attendance record, averaging more than 17,000 in each of the eight home games. That set up another East final against New York, and this one would not be in the friendly confines of HSBC Arena. In fact, the game was set for the Continental Arena in Newark, N.J., where the Titans had played half of their 2009 games. Interest was not at a fever pitch; fans could simply say "Newark" at the box office the night of the game and get a general admission ticket (and the whole building was general admission) for $5. Bandits fans made the drive in large numbers, and they may have outnumbered their Titans' counterparts. They certainly outshouted them before the game. What those fans saw was a stinker of a contest, particularly from the Bandits' standpoint. Very little happened in the first half, prompting one media member to ask, "Aren't the games usually better than this?" However, the game slowly turned in New York's direction. Casey Powell had two goals and five assists for the Titans, who went on to a 9-3 win. It was a Buffalo team record for fewest goals in a playoff game, and just missed a league record. Steenhuis and Tavares were blanked for only the second time in 2009. "You're not going to win when you score only three goals," Kilgour said. After the game, the 40-year-old Tavares was talking about retirement, probably out of frustration, coach/general manager Kilgour was wondering if it was time to give up one of his jobs, Rich Kilgour was ready to retire and become a college coach, and no one was speaking of standing pat in the coming offseason.